1. How big should my betta fish's tank be? A betta fish can live in a fish tank that holds no less than 1 gallon of water. Although many fish supply stores may sell or advertise betta tanks that hold less than 1 gallon of water for permanent housing, these fish tanks are deadly for betta fish. These small fish tanks quickly build an invisible, but highly toxic, chemical called ammonia. This chemical is the #1 killer of betta fish and is released naturally into the water from betta waste, uneaten food, and exhale from gills. Because of how fast toxicity can build up in low-volume tanks, it is always better to provide as large of a tank as possible. Tanks with higher volumes can also complete the nitrogen cycle, which is a natural chemical cycle that detoxifies ammonia and nitrite through the establishment of beneficial bacteria in a filter and it requires only partial water changes; this means less work for the owner and a preferable level of quality for the betta fish's life. The cycle is most commonly maintained in a tank of 5 gallons or more, especially for those new to creating and maintaining the nitrogen cycle. Fish tanks that hold less than 1 gallon of water are also dangerous because they cannot maintain heat or be safely heated up to a proper temperature. Because betta fish are tropical fish they need water between 76 and 86 degrees (F), preferably in the 78 to 82 degree (F) range. Although a tank that holds less than 1 gallon of water may be in a warm room and feel to be in the appropriate temperature range, it is very easy for water temperature to drop 10 degrees over night and such extreme changes can cause the fish stress, lowering their immune systems, and sometimes causing their fins to clamp. There is no limit to what size a betta tank can be. However, it should be noted that due to poor conditions in pet stores and occasionally genetics, some betta fish cannot be placed in very large tanks for health reasons; this is a rare scenario. Regardless, they still need at least 1 gallon of water. 2. How often should I change my betta fish's tank water? 2 gallons: 50% water changes 2-3 times a week and one 100% water change weekly. Another tank size too small for cycling, it is important to mantain regular water changes. Gravel vacuums will make cleaning easier and help mantain better water. 5 gallons: This is the first tank size that can be cycled and thus is has two different water change schedules. For cycled tanks, perform 50% water changes weekly. For non-cycled tanks perform 50% water changes twice a week and one 100% water change weekly. Non-cycled tanks are much ahrder to clean and it is recommended that a cycle is established for the this purpose. There are many other tank sizes but these are some of the most common. For in-between sizes, adjust the schedule to your best judegement. Although these are not absolute, strict, must-have schedules, they are recommended for the best health of betta fish. 3. Does my betta fish REALLY need a heater? Yes! Betta fish are tropical fish, originating from areas around Malaysia and Thailand. Although a tank may be kept in a warm room, unless the room temperature never goes below 80 degrees it is unlikely that the water temperature will not get colder at night, which can easily happen by 10 degrees. A heater is essential for betta fish health. 4. Can I place another fish or aquatic animal with my betta fish? Despite common misconceptions about betta fish, they CAN be placed with other species under certain conditions. First, you must find out if a species is compatible with betta fish. Goldfish, for example, are not. If the tank is appropriate to accommodate the chosen tankmate species and if you do not have a very aggressive fish, a community tank can be established. A male betta fish, however, can never be placed with another of its own species without a strong divider separating them completely. Males cannot even be placed with females of their own kind unless during breeding, which is a very difficult practice, and after breeding takes places they must be separated once again. Males will kill females that are not ready to breed or females they do not like. Female betta fish, however, can be grouped together. Females need to be in groups of 3 to 5 at the smallest, preferably with an odd number so no one female becomes aggressive toward the others. A group of female betta fish is called a sorority and can only be established in a tank of at least 10 gallons for small groups. 5. A pet store employee told me to feed my betta fish three times a week with as much food as possible in 3 to 5 minutes. Is this true? a.) Although a betta fish can go long periods of time without eating, it is not optimal for its care. A dog, in comparison, can survive on being fed twice a week but that does not mean it is the proper way to take care of the living creature. Similarly, betta fish do need to eat everyday with a nutritionally varied diet. b.) A betta fish's stomach is only about the size of its eye. Eating such a high amount of food can cause bloating and constipation, even death in some cases. A betta fish will literally eat until it dies due to instinct and should only be fed approximately 2 to 3 pellets, depending on their size, once in the morning and once at night. 6. 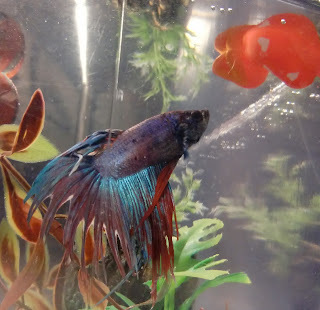 My betta fish is not eating! Is he or she sick? Betta fish stop eating for a few reasons. One is that they are recent purchases. Newly purchased betta fish may not eat due to the stress of moving from the pet store to a new tank. This behavior can persist on average up to a week. Some adjusting to the new surroundings, without much disturbance, is needed before some new betta fish will eat in their new homes. The other most common reason that a betta fish will not eat is because it is stressed or sick. This is usually easily to identify because the fish will go from normal behavior (swimming, eating regularly, etc.) to not being interested in food or showing interest but spitting food out. In these cases it is important to identify what caused this change in behavior as sometimes time is of the essence. Check water parameters for ammonia, nitrite, and nitrate using a water test kit and see if the readings are off. Depending on what is wrong, there are different approaches to making a fish well enough to eat again. It is important not to panic during a non-eating period and buying many different kinds of food in order to appease the betta fish's appetite. While some betta fish will only eat flakes, it is rare for betta fish not to be able to eat their regular food and bribing them with junk food such as freeze-dried blood worms is harmful. 7. I am going on vacation. Should I buy an automatic feeder so my betta does not get hungry? Automatic feeders or large pieces of food that meant to sit in a tank during a vacation so the fish can feed itself are deadly. Such automatic devices release too much food for betta fish to handle because they go by the allowing a fish to east as much as it can in 3 to 5 minutes rule or something similar. Many betta fish owners have returned to find their betta fish having eaten themselves to death or too much food released into the water, creating unsanitary living conditions. Betta fish are hardy fish and while it is not good to leave them unfed for days on a regular basis, they can be fasted. In fact, certain medical conditions require them to be fasted and so long as fasting does not become a regular habit it is okay for a betta fish to go through one. Betta fish can be fine for up to a week without food if they are fed before the owner's leave but any more time than that is not recommended and can be harmful. Any time away from a betta fish that is longer than a week should involve a pet sitter, especially since water changes will be needed in addition to food care. 8. My betta fish is making lots of bubbles at the surface of his or her tank water. What does this mean? This is called a bubble nest. A bubble nest is created when a betta fish is ready to mate, usually created by the males but females are known to create these as well. A bubble nest is not an indication of a betta fish's health or happiness. There is nothing that you can do to make a betta fish create a bubble nest; some make them and some do not. Just because a fish is making a bubble nest, it does not mean that you should buy the fish a mate. Breeding is difficult and can result in over 100 babies easily, all of which need very special care and eventually their own fish tanks, heaters, and other equipment. 9. Does my betta fish need a filter? Is a bubbler or an air stone a good replacement for one? A filter is not needed for a betta fish. It is, however, needed if you wish to establish the nitrogen cycle in your tank. A bubble or air stone is not a replacement for a filter, as neither creates a home for good nitrifying bacteria that will help keep your tank non-toxic. Rather, these devices are good for adding an extra supply of oxygen to the tank in order to make it easier for the fish to breath, especially in large tanks. 10. I had a friend who did not follow these rules and kept a betta fish in a small, unheated, bowl that had its water changed whenever my friend felt like it. How did the betta fish live for a few years in these conditons? Betta fish are often subjected to conditions that rumors about their care create for the casual owner. It is not normal for betta fish to live long in such conditions. That being said, the pet store betta fish species is hardy and some rare fish may survive in the harshest of conditions even if their proper care is neglected. This is not the norm, however, and should not be the way the betta fish should live. Just because a living creature can survive in certain conditions, it does not mean that the creature should have to. A betta fish in these conditions will be more prone to illness, inactivity, and slow poisoning. It is not a life of quality and is comparable to keeping a dog in a small cage its entire life; the animal can survive for many years but it will not live a life of pleasure. 11. How long do betta fish live for? Depending on the age of the fish when purchased, genetics, and pre-exposed conditions, a betta fish can live to be 5 years old or higher. On average, they live between 3 and 5 years. 1. What is Betta Fish Awareness Day? Betta Fish Awareness Day is two things. First, it is an awareness group aiming to end the myths and misconceptions about betta fish care. Second, there is an official day declared by the group for the purpose of raising awareness on proper betta fish care. The official Betta Fish Awareness Day is held on June 21 each year. 2. Is Betta Fish Awareness Day associated with bettafish.com or other betta fish related online communities? No, there is no relation to these websites. The original idea came from a member of several betta fish online communities who runs this blog and the Facebook page. The websites that the online community member has joined, however, have no affiliation or input into how this blog or the Facebook page is run. Although these sites may be referenced in articles, they are only referenced and are not, unless otherwise specifically stated, contibutors or have any control over the content. 3. What is the Facebook page for Betta Fish Awareness Day? Is there more than one group or website for the group? The official url of the official Betta Fish Awareness Day group on Facebook is www.Facebook.com/BettaFishAwarenessDay and there is no other page or group affiliated with it. Only this blog and the given link are related. 4. Does Betta Fish Awareness Day support PeTA or PeTA-like tactics for raising awareness about improper betta fish treatment? Betta Fish Awareness Day is adamantly against PeTA and PeTA-like tactics. This is because PeTA has different values than Betta Fish Awareness Day and is known to ethically and financially support the recognized terrorist organization ALF, the Animal Liberation Front, which is a group that believes in "total animal liberation" from humanity and has firebombed medical research facilities that use animals for tests as well as other acts of violence. Rather than violence, Betta Fish Awareness Day supports education on animal care and stricter regulations about animal abuse. 5. Can I adopt a betta or purchase proper betta fish equipment through Betta Fish Awareness Day? No. This group is not an adoption agency or supplier of fish and/or their supplies. Questions on where to adopt or purchase equipment for betta fish can be answered through this group, however. 6. How can I trust your information? If there are so many myths and misconceptions about betta fish, who is to say this group does not contribute to them? Betta Fish Awareness Day believes in education on betta fish care rather than caring based off hearsay. Thus, all of the articles are sourced and referenced from trust cites and at the bottom of each article the references can be obtained and looked at by readers. In order to end myths and misconceptions about betta fish it is first important to identify proper information from reputable sources, which is the goal of this group. If any misinformation is posted on any article, please comment or send an email to BettaFishAwarenessDay@gmail.com and the matter will be looked into and corrected if needed. 7. I have a great idea that should be featured on your blog/Facebook page! Will you take it and feature it? Ideas are always welcomed. However, there is no guarantee that they will be implemented. If you have an idea about a way to raise awareness or have a topic you want addressed, please either send an email to BettaFishAwarenessDay@gmail.com or leave a comment/private message on the official Facebook page. 8. I want to spread information about proper betta care! I have created a flier/poster/business card that I want to leave in pet stores that addresses this. Can I leave your blog or Facebook url on the back or bottom of my care sheet? Due to legal reasons, no. While you may have good intentions, if a store or other business entity feels that what you have created is harmful to their practice then they will assume this group is to blame. Betta Fish Awareness Day has created a series of Myths VS Facts posters that have its Facebook url attached to the bottom that can be distributed at appropriate events or hung up in appropriate places. Do not create your own informational piece and connect association with this group, no matter how wonderful your intention may be. 9. I am a member of a website. Can I link either to this blog or to the official Facebook page in my signature or on my profile? So long as you do not post anything illegal or falsely advertise Betta Fish Awareness Day, feel free to spread this blog and the official Facebook page to all you may know. 10. What time zone is Betta Fish Awareness Day posting information from? This blog, as well as the official Facebook page, is linked to Eastern Standard Time (GMT -05:00). Hello, I just recently got back into the hobby and got a Betta that's housed in a 2.5 gallon tank. The tank is filtered, has a heater (78-80 degrees all the time and one live plant that seems to be thriving (I also use an auto timer for the light). I believe I have successfully cycled this little tank as I test the water weekly and after about 3.5 weeks the levels are ROCK steady, regardless of how many water changes I do (which I do 50% water change, once a week). Ammonia is 0, Nitrite is 0, Nitrate is 10ppm and PH stays at 8.2 (I live in Las Vegas). During the cycle the highest I saw the Ammonia spike to was 0.50 and I could tell the fish was stressed. So it is possible to cycle a 2.5g tank with proper care! BTW, I feed my fish 1-2 pellets A DAY and the fish is extremely energetic and healthy FWIW. Thank you so much for this information. I do not see my Betta girls as decorations. I CARE about and LOVE them as I do my cat. I want the best homes for them. I've got 2 girls. The larger female is in a planted 5 gallon planted tank, the tiny girl who is 1.5 inches is in a 2.5 gallon tank with a small, maintained Java plant on driftwood. They also have duckweed. The problem is they look skinny, so I got on the net and looked up some information about how to feed them. Your site has been most helpful in that search but also with other information. I wasn't feeding them enough. Poor girls. I know now and will adjust accordingly. Also, I am very aware of the horrible information given out by pet store employees. Most of what Wal-mart does is underhanded and harmful either to the environment, people or pets. They are as a company ...horrible. Anyway, thank you for all the information. I just wanted to say that your information is very important for people to find to help them care for Bettas properly. On a personal note, I wanted to comment on all the folks slamming pet store employees. I work in a large pet store and PERSONALLY have nearly 40 years successfully raising and caring for Mammals, Birds, Reptiles, Amphibians and Fish (including Bettas---some living to nearly 8 years old). Not all of us are ignorant children. EVERY PERSON INTERESTED IN PURCHASING/ADOPTING A PET SHOULD RESEARCH, RESEARCH, RESEARCH SAID ANIMAL THOROUGHLY BEFORE DOING SO. There ARE still libraries, you know--In nearly every city. Many sources on the web cannot/should not be trusted. Next time a pet store employee shares care information with you--just do your own due diligence and verify that info with at least 3 different trusted sources. There are many good books available on proper Betta care. This is very nice post as usual, very useful. Wow! Such a wealth of information shared in this one post. I really appreciate tip number one because many people do not know that the size of the tank matters and they end up buying a tank that really doesn't suit their fish. Knowing when to change the water based on the fish tank size is also very important. I was just recently given a betta fish this past Friday for my birthday, I've already cleaned his tank Sunday and I plan to do so again tomorrow, however I won't be able to get a heater or nitrate tester this weekend. Will my fish be okay for the rest of this week? I'm actually new to raising a betta since this is my first fish since I was younger. Which brands do you recommend for me to buy? And is the Betta Safe dechlorinate safe to use in his tank? The tank that was given to me is about a gallon as well, should I get a new one? Yes. At least a 5 gal. Plus heater and filter. Get a thermometer too, and water test kits. One for ammonia plus one that tests for nitrates. Don't forget your water conditioner. Prime is a great one. Set up the new tank and begin changing out 25% water changes once a week. When u transfer ur new friend don't use a net, they hate that. Use the cup he came in or ask the pet store for another one if you tossed it. They come in handy. Float him like you did when you brought him home to acclimate him. Then let him swim out into his new castle. He will be much happier. Thanks for all the ideas. Just take help from internet and online sites to know about other things in detail. Nice one, you people can take help from the Pet Grooming Tips so that you can get your pets groomed and taken care properly so that the mortality rate of your pets is really low. You can also take help from the other breeders to know about everything in detail as experience is also very important factor in any business. اقوي قطع الغيار مقدمة من خدمة عملاء كاريير لجميع عملائنا في جميع انحاء جمهورية مصر العربية ومع شهادات ضمان تصل الي عامين. I was doing an online research on The Importance of Writing Chapter Two for a Dissertation before I landed on this amazing page and I have learned a lot about the fish species. Thank you so much for cresting awareness about the fish. I hope the information will reach out to a larger number of online users so that they can be informed and educated. The simplicity with which the blogger has given the details of this blog is a motivation and I believe it will assist many people in realizing their potential. In fact, it is always good to accredit such publications and help the others have access to them. I have loved to be part of this beautiful and informative forum. I even know that as I continue with Commentary Posts Writing and posting in this site I will learn more. تعمل على تنظيف خزانات المياه من خلال إستخدام أقوى فرش التنظيف حيث يقوم أحد طاقم الفريق بالنزول إلى أسفل الخزان من أجل أن يعمل معاينته بطريقة جيدة وثم يبدأ في التنظيف الشامل للخزان بإستخدام فرشاة التنظيف القوية التي تعمل على إزالة الشوائب والرواسب والطحالب المترسبة داخل الخزان . صيانة وايت ويل بالاسكندرية ترتيب وضع الاواني والاطباق او الأكواب له عامل أساسي في عملية التنظيف فلا يمكن أن تنظم وضع الاحمال كما يحلو لك ولكن يجب أن ترص كما يوضح لك كتالوج الآلة فمثلاً الأكواب أو الأواني يجب أن توضع في وضع مقلوب أي الجزء المفتوح يكون أتجاهه إلي أسفل وبالنسبة للأطباق تختلف من غسالة إلي أخري تبعاً لتصميمات فتحات الرشاشات فيوجد بعض غسالات يجب وضع ظهر الطبق جهة الشمال ويوجد العكس في غسالات أخري والملاعق أو السكاكين طبعاً توضع داخل السلة الخاصة بهم في وضع رأسي واليد إلي أسفل وبالنسبة للأطباق تختلف من غسالة إلي أخري تبعاً لتصميمات فتحات الرشاشات فيوجد بعض غسالات يجب وضع ظهر الطبق جهة الشمال ويوجد العكس في غسالات أخري ،والملاعق أو السكاكين طبعاً توضع الأحمال جيداً بحيث لا يتحرك أي منهم أثناء عملية الغسيل فقوة اندفاع الماء تكون قوية ويمكن اصطدام طبق في الآخر بسبب عدم وضعهم جيداً ،صيانة وايت ويل بالاسكندرية كما يجب التأكد من حرية حركة دوران الرشاشات وأنها لا تصطدم بأي جزء وأن الفتحة التي تغذي الرشاش العلوي لا يغطيها شيئاً ، في بعض موديلات قديمة الرشاش عبارة عن ماسورة ثابتة لها فتحات والأطباق توضع علي حامل مرتكز فوق عمود والحامل له حرية الحركة وعند أندفاع الماء من الرشاش الثابت قوة الماء تؤدي إلي دوران الحامل الموجود عليه الأطباق ،من الممكن وجود أكثر من رشاشين في بعض موديلات سعة أكبر ،عند ترتيب الأحمال يجب أن تتأكد من حرية دوران الرشاشات وأنها لا تلمس أي جزء وأن الفتحة التي تغذي الرشاش العلوي من سقف الغسالة غير مغطاه بأي أطباق كذلك إذا كانت الغسالة بها فتحة في مركز الرشاش السفلي صيانة وايت ويل بالاسكندرية يجب أن تكون حرة أيضاً ،في حالة إذا كان الرشاش العلوي مثبت في سقف غرفة التحميل تكون ثقوبة من أسفل فقط اما إذا مثبت أسفل شبكة الأطباق العلوية فثقوب الرشاش تكون في الوجهين فوق وتحت . صيانة وايت ويل بالاسكندرية المعتمدة رسميا من قبل شركة وايت ويل العالمية و من مهمتنا تقديم خدمة صيانة وايت ويل فى الاسكندرية حتي نستطيع أن نكون بجوار عملائنا و نستطيع تقديم خدمة مميزة بعد انتهاء فترة الضمان . صيانة وايت وستنجهاوس بالاسكندرية عند فك الرشاشات لأي سبب يجب تمييز الرشاش العلوي عن السفلي وعند إعادة التركيب لا تبدل وضع رشاش مكان الآخر حتي وإن كانوا من الظاهر متساويان لكن أحياناً كثيرة تختلف زوايا فتحات واحد عن الآخر ،بعض الغسالات لها امكانية غلق طريق امتداد الرشاش العلوي تماماً وذلك في حالة وجود أحمال في الشبكة السفلية فقط الرشاشات عبارة عن مواسير ثابتة في أركان وسقف الغسالة هذه المواسير بها فتحات تخرج منها الماء وترص الأطباق علي شبكة تحمل فوق تارة معدنية مركزها مثبت فوق عمود بحيث يكون لهذه التارة حرية الحركة وبأندفاع الماء من الرشاشات الثابتة علي الأطباق تبدأ التارة وما تحمله في الدوران فقط بقوة اندفاع الماء " الأعطال الخاصة بالرشاشات" كما رايت فالرشاشات لها دور رئيسي في عملية الغسيل فقوة اندفاع الماء المتدفقة منها أثناء دورانها هي التي بواسطتها يتم توزيع الماء علي كل جزء موجود داخل غرفة التحميل وقوة دفع الماء معتمدة علي: قوة طلمبة الغسيل، نظافة الفلاتر بحيث يصل للطلمبة أكبر كمية ماء في أسرع وقت ،نظافة ثقوب الرشاشات وخلوها من أي ترسيبات ، صيانة وايت وستنجهاوس بالاسكندرية سلامة مسارات الماء من بداية خروج طلمبة الغسيل وحتي وصولها إلي المداخل الرئيسية للرشاشات في حالة توافر النقاط السابقة يعني قوة اندفاع ماء شديدة وبالتالي إذا كانت الرشاشات حرة الحركة ستدور وتوزع الماء بقوة علي جميع الأجزاء ، أما إذا وجد أي عائق لدوران الرشاش فلن يستطيع الدوران وبالتالي سيصل الماء إلي أجزاء معينة وعلي أجزاء أخري لا يصل أما في حالة ضعف قوة اندفاع الماء بسبب عدم نظافة الفلاتر أو ضعف طلمبة الغسيل أو سد ثقوب الرشاشات ستخرج الماء من الرشاشات ضعيفة وبالتالي لن تدور الرشاشات وفي هذه الحالة لن يحدث تنظيف وستخرج الاطباق مبتلة فقط الخلاصة أن الرشاشات يمكن أن تكون سبباً من عدة أسباب كثيرة في عدم نظافة الاحمال أو نظافة أجزاء منها والاجزاء الاخري لا ،صيانة وايت وستنجهاوس بالاسكندرية من الممكن حدوث تآكل في مركز الرشاش أو في العمود المرتكز عليه يؤدي إلي خفض سرعة دوران الرشاش بالاضافة إلي حدوث صوت أعلي من الطبيعي . اعتمدنا في مركزصيانة وايت وستنجهاوس بالاسكندرية علي فريق حاصل علي أعلي درجات التمكن واللباقة من موظفيين خدمة العملاء الذين يقدمون أفضل خدمة عند إتصال أي عميل علي أرقام صيانة وايت وستنجهاوس بالاسكندرية وبالتالي نسعي دائماًبشعور العميل بالراحة والسعادة والتميزلأننا حقاً أكبر مركز صيانة متميز.